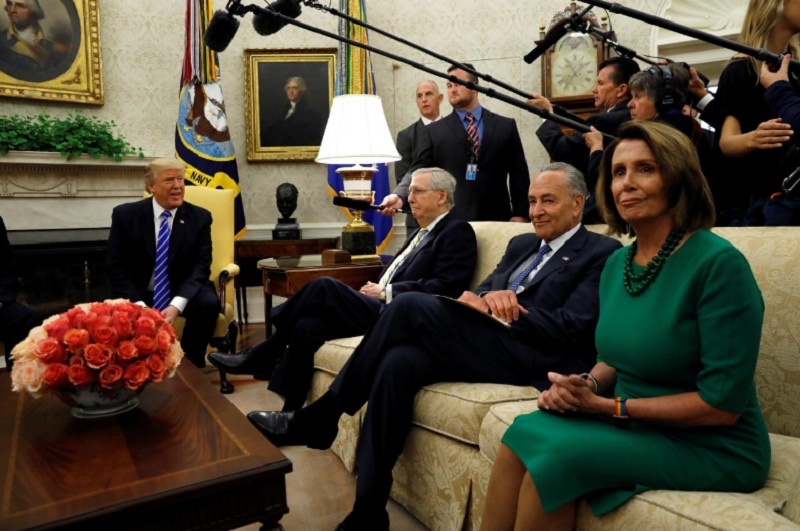 FILE PHOTO: U.S. President Donald Trump meets with Senate Majority Leader Mitch McConnell (L), U.S. Senate Democratic Leader Chuck Schumer (2nd R), House Minority Leader Nancy Pelosi (R) and other congressional leaders in the Oval Office of the White House in Washington, U.S., September 6, 2017. WASHINGTON - President Donald Trump and Democratic leaders in the U.S. Congress have agreed to work together on legislation to protect “Dreamers,” the illegal immigrants who were children when they entered the United States, the lawmakers said on Wednesday, although a dispute erupted over exactly what had been agreed. Following a dinner with Trump at the White House, Senate Democratic leader Chuck Schumer and House of Representatives Democratic leader Nancy Pelosi said the “productive meeting” focused on “DACA,” a program established by former President Barack Obama. “We agreed to enshrine the protections of DACA (Deferred Action for Childhood Arrivals) into law quickly, and to work out a package of border security, excluding the wall, that’s acceptable to both sides,” Schumer and Pelosi said in a statement. “While DACA and border security were both discussed, excluding the wall was certainly not agreed to,” she said on Twitter. Following the dinner, a White House official said the president, Schumer and Pelosi discussed tax reform, immigration, border security, infrastructure investments and trade as part of Trump’s bid to reach out to Democrats. “The administration looks forward to continuing these conversations with leadership on both sides of the aisle,” the official said. “Those discussions will continue,” the lawmakers said. Using his executive powers, Trump canceled Obama’s DACA program in which about 800,000 undocumented young people have escaped the threat of deportation and been able to apply for work permits in the United States. Trump argued that Obama over-stepped his authority in creating the program. Cuellar said Trump urged lawmakers to link a Republican bill to cut legal immigration to the United States with protections for Dreamers. But many Democrats oppose lowering the cap on annual legal immigration. President Donald Trump and Democratic leaders in the U.S. Congress have agreed to work together on legislation to protect “Dreamers,” the illegal immigrants who were children when they entered the United States, the lawmakers said on Wednesday, although a dispute erupted over exactly what had been agreed.